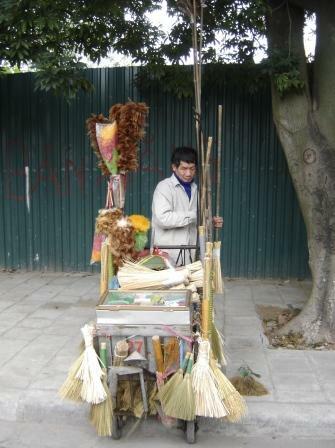 There are lots of organizations helping blind people to make lots of different products such as brooms, incense, feather dusters and tooth picks. That's why you can see them easily on the street. I really admired these people who try to earn a livelihood instead of being beggars. They only make a small income. What amazes me more is that they don't get killed or injured wandering through the crazy Hanoi traffic without full vision. Most of the brooms are made from bamboo and coconut trees and certain types of grass while the dusters are made from chicken and duck feathers. I wonder if the bird flu is also having an effect on the productions of them. Due to the bird flu, lots of people are losing their businesses and money. I talked to a lady who sells my favourite duck eggs near my work. She said that she had lost quite a bit of money for the duck eggs that she bought in advance. She also tried to sell for a few more days after the scare was official but not many people wanted to risk their lives. 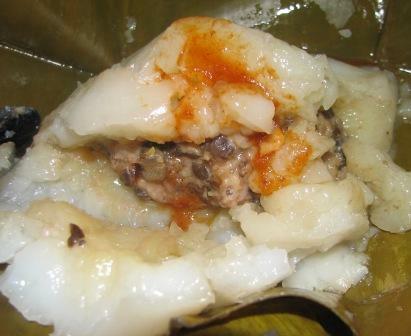 This is the reason why she has started selling Bánh Gio (steamed rice cake with pork, mushroom, onion and pepper wrapped in banana leaves) served with chilli. 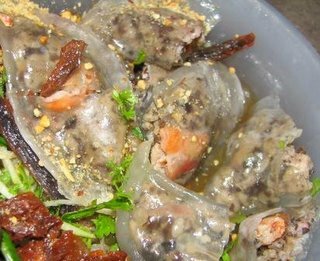 The good thing about this dish is that there is no specific time when it is eaten, which means it can be found somewhere in Hanoi at any time of the day. It's a good choice for hot winter food. 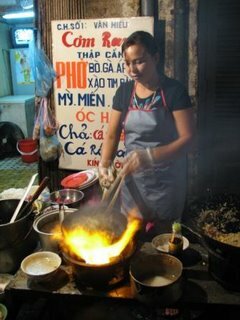 You also can ask her to order, from the stall across the road, some Nom- green papaya and dry beef or liver salad and Bánh Bot Loc-steamed rice pan cake with shrimp, mushroom and pork. Enjoy these dishes with a hot cup of tea; sit in front of the old church in Ham Long. It's a good place for a snack. 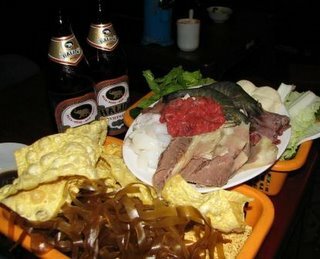 One of my friends from the province of Thai Binh told me that it is famous for cat meat. They kill thousands of cats every day and there are heaps of restaurants along the main streets there. Cats from everywhere, other cities, from the mountains, and cats also control and kill thousands of rats in the fields. I was attending my colleague's wedding and I was shocked that he served cat meat. 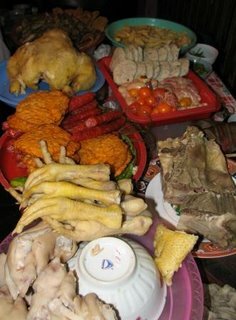 It's hard to tell the difference between cat meat and chicken if you are not from Thai Binh . 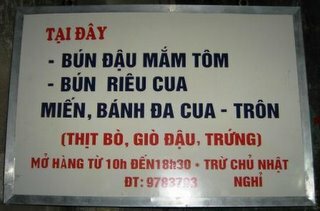 Residents of Thai Binh say that cat meat can release your bad luck and they eat it early in the month. 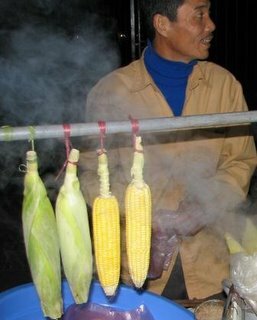 Thai corn and Viet corn are so popular in winter in Hanoi. 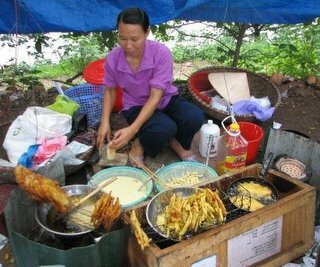 The sellers will try to tell you that they are selling Thai corn instead of Viet corn saying it is sweeter and therefore more expensive. To make sure, you should try one seed. Thai corn is usually bigger than Viet corn. Even the corn water in which the corn is cooked is sold. 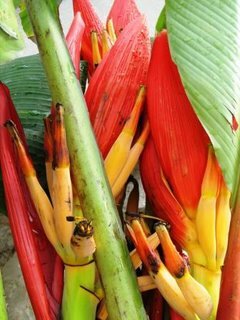 It is really sweet, healthy and lots of people drink it with ice or warm. When eating, you can choose between steamed corn and grilled corn. 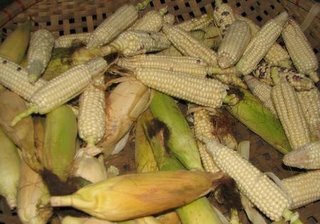 The steamed corn is more popular on the big streets in the city than grilled corn. They are normally the same price - just cheap. 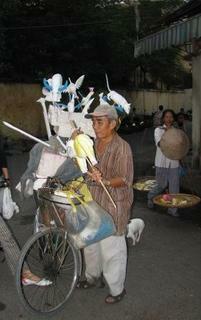 Teacher's day is one of the special days in Viet Nam which is on the 20 November. Most teachers recieve heaps of gifts, flowers or their students take them to the restaurant for a feed to express their appreciation to their teachers who give them knowledge. When I was a student I loved this moment, going out with my class mates to visit my teachers at their homes, talk to them. Experience can be gained in real life but what you learnt from teachers is also important and can be used in real life. 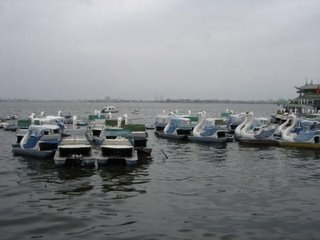 The freezing north west wind is coming to Hanoi giving everyone the chance to dress up in their winter clothes. This is one of the best time in Hanoi to sit down on the paverment watching people wandering around. I am from the south so that I can't really stand this cold. Of course, I am used to it after over 3 years living here but, it seems to get colder every year in degrees. I always wear heaps of clothes, gloves, hat and jackets but I still feel cold. Is that weird? Yes, I know that and I can't do anything more to overcome the chill. But I love cold Beer. From October to January is the wedding season in Vietnam. Many couples and their families are busy making plans for their special days. From my subjective point of view, the rich people arrange their weddings in an expensive way in opposition to the budget couple. Of course, people also get married in churches and other public places as well. They celebrate their weddings in hotels and restaurants of different levels. 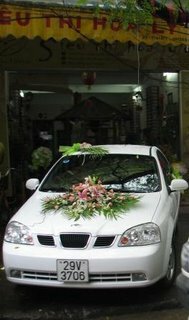 Families with lots of money have their parties at high class restaurants or hotels, hire a nicely decorated bridal car for the bride and groom while budget couples celebrate at small restaurants or at home. Taking photos before the wedding is a custom that everyone follows, and lots of people go mad taking pictures by changing into so many different clothes and of course, they have to pay a fortune at the end. Weddings in the countryside are totally different. Food is cooked by relatives of the bride and groom. Most of the foods are produced in their own gardens, from the poultry to the veggies. They serve their own home brewed rice wine, instead of beer. They serve specialities of the local region. Some dishes are weird and customs vary according to area. 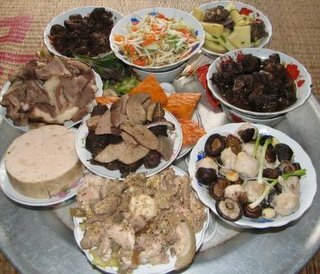 For example, in Thai Binh cat is served at weddings and in Ha Tay it's dog. It is said that dog should only be eaten at the end or in the middle of the month to release bad luck, and cat is good to eat early in the month to bring luck? 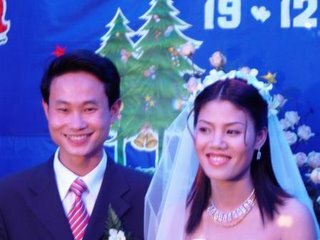 In Hanoi, if you wander around the photo studios, the Opera house, the rose garden behind Ho Chi Minh museum, or Reunification Park you'll see lots of couples waiting for their turn just for a few photos. 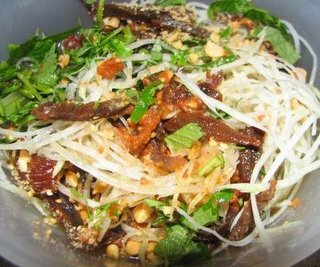 Mixed vermicelli with beef, crab meat, mushroom, tofu, celery, sliced pig's ear mince wrapped in banana leaf, and bean shoots is one of the best snacks in Hanoi but you must have it with soy sauce and chili otherwise they taste very bland. 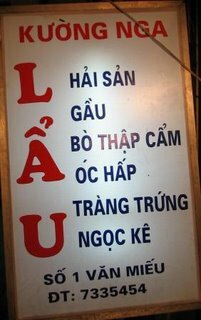 This place is located in a small lane at 8 Le Ngoc Han Street where there are two small restaurants, the other selling a different dish. 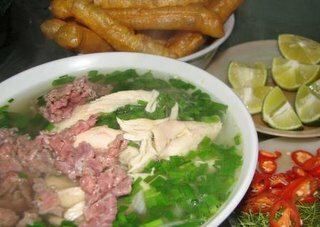 They also serve French fries with sesame seeds and some other noodle dishes such as Hai Phong noodles which are yellow, normal noodles with crab meat, noodles and tofu. If you want to sample a bit of everything, do not hesitate to ask them as they will make a mixed plate. 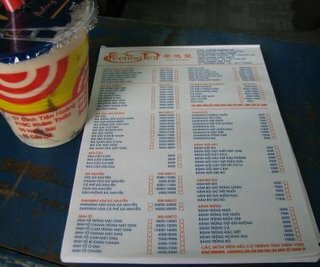 From 6000Vnd that you can get a cool refreshing gingseng drink with lots of small square or round agar with different shape and colours right on the street or sit in the small shop called feeling tea shop. Of course, this doesn't help your physical health but it keeps you cool. These Taiwanese tea shops are so popular in Hanoi rising everywhere like mushrooms after the rain. Several different chains seem to exist but I'm not sure which one is the best. 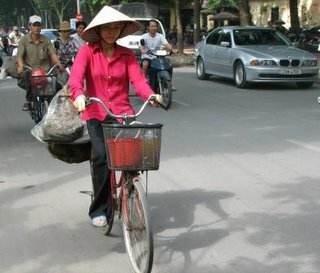 Occasionally seen in Hanoi are men and women riding bicycle with at least two big bee's nests into the city. These bee's nests are from the mountains and they sell them to people who want to soak them in rice wine. 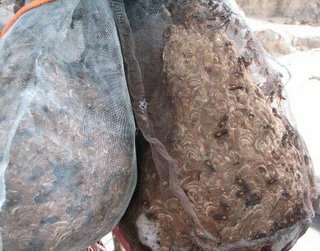 These bees and their nests are sold from 200,000Vnd for a kg and the average nest weighs two kilos. Soaking one kg of bee's nest in five liters of rice wine and takes at least 5 months to infuse. People say that this bee wine is very healthy, it helps clean your blood, reinforce your immunity and fix your physical problems, but I don't really think so. You can try some at any Vietnamese wine shop. A very simple ad hangs on the tree with names and prices for crispy fried bananas, crispy fried sweet potatoes and crispy fried corn, deep fried in batter. All these delicious cakes are available on Yen Phu street near the Thang Loi hotel on the pavement. There are two woman partners in this business for over 6 years. Ms Thu, the older lady has been open for business forover 16 years, selling sweet che. They do business all year, selling che from May to October and these fried pieces from October to May. She is just a lovely calm lady who is always smiling and speaks to you softly and this may be one of the reasons why people keep coming back. She spends two hours from 5am to 7am preparing and starts trading at 9Am and continues till 6pm. Most of the supplies are delivered and she only does the final phases such as peeling the skin and chop it into pieces. Bananas she presses to make flat and cooks straight away. If you drive past this area, you will see lots of people sitting on small plastic stools, enjoying the fried cakes with a piece of news paper wrapped around the cake. This is a classic way and I love it. The winter is coming and these are great on a cold afternoon. 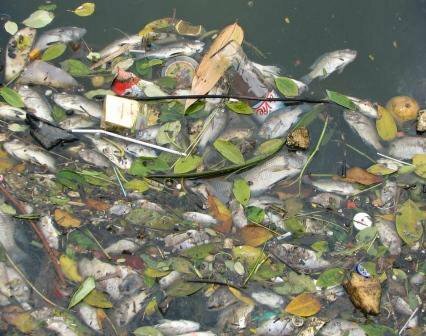 These days, for some reason there are a lot of dead fishes floating in Truc Bach Lake. There are lots of people collecting the dead fishes. I really don't know their aim but with my thinking is that they are collecting them to make fish sauce or feed their animals or maybe they sell them at the market. 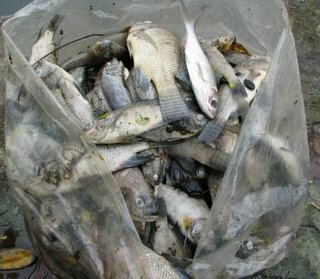 You never know what would happen after you or your animals eat these fishes. This is the result of people who have no consciousness of the effect their behavoiur can have on a beautiful lake. It's a sad and serious situation. 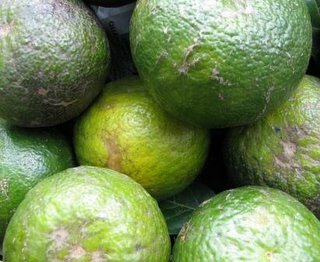 Đánh giầy is my story today. This is a strange story of the street perhaps doesn't happen in other countries. 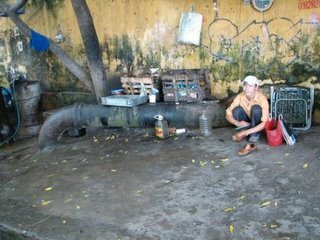 For 2000Vnd, you can have your shoes cleaned and they look like new shoes. There are lots of little boys doing this business, wandering around with a box or a plastic bag and some shoe-laces hanging from the top of the box. Most of them are from the countryside trying to avoid farming work, school or for family reasons. However, there are some boys who are from the city trying to earn some money for their study or for some reason or another. 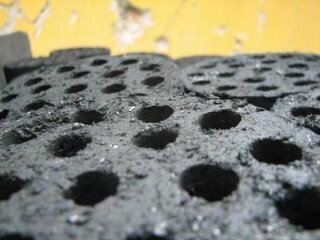 One of the hardest work in Hanoi is the coal seller. 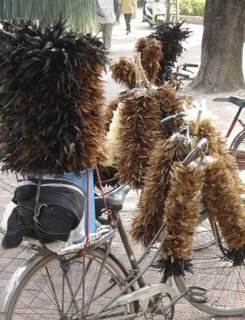 You can see heaps of them riding around streets on a very simple bicycle without hand brakes full of coals about 2 meters high. Their clothes and bodies are black but their teeth are white. People joke that, if the coal sellers walk on a dark night without smiling, someone might get shocked to death when the black ghost appears. For stunning beauty in this current season, people go for banana flowers. This flower lasts for over a week and two or three stems look beautiful in a big vase. 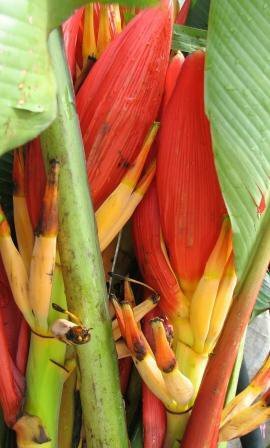 Banana flowers are not really expensive, at only costs about 10,000Vnd for one. The structure and color of these flowers are worth it. Bananas also are a good fresh fruit or cooked fruit for dessert as well. 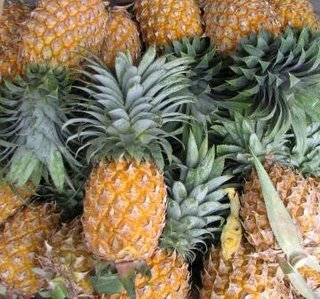 Pineapples are a great fresh fruit for any season, though it's better in the summer because it's juicy and refreshing. It's sometimes very sour but most of the time it is sweet. In Vietnamese cooking, we use it a lot. 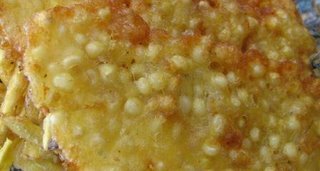 Have you ever tried pineapple pancake? They're not bad. Mandarins are the best fruit choice at this time of the year. There are two kinds of mandarins, one is small and the other is bigger, about the same size as an orange. 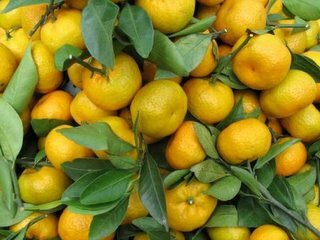 The smaller mandarins without seeds are sweeter and more expensive, the others a bit sour and the quality depends on where they come from. Oranges are good for any season because they are healthy. Everyone loves oranges from sick people to athletes. Lots of people drink orange juice and make cakes using them. There are some old men who use recycled foam boxes to make surprising birds, dragons, elephants and air planes... as toys for kids. These talented men make these toys for kids which they can play with safely. They always have a story to tell the kids, too. One old man was telling a little girl where the elephant had been as he was painting it. 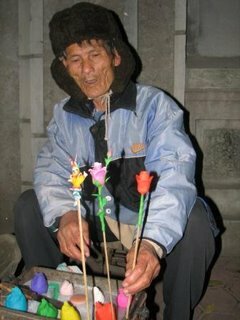 Some other old men use rice flour to model toys such as roses, soldiers with a gun, chickens, and lots of other different shapes. It takes them about thirty minutes to finish these fun toys and sell them for about 5000Vnd each. This business is not new in Hanoi and I think it goes way back to some tradition. If you have a chance, drive along Phung Hung street and you'll see lots of Lau (hot pot) restaurants. 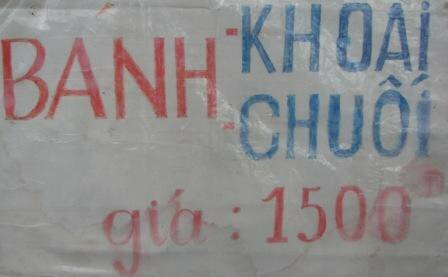 But No 1 Van Mieu- Kuong Nga is my recommendation and you would agree with me about the quality. They opened their business 24 years ago: the mother ran the restaurant for a long time but now it's the five daughters' turn. 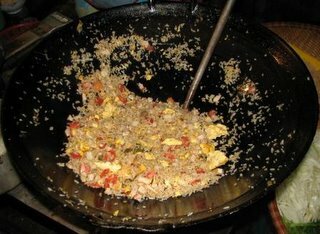 They are doing well with fried rice and noodles and Lau for lunch and dinner and noodle soup for breakfast. Lots of people choose to celebrate their birthdays or other special occasions by ordering hot pots because they can have a long chat and a drink of rice wine, beer or soft drink. This is such a good choice for a winter feed and not very expensive, only costing from 100,000Vnd up to 150,000Vnd for four or five people. 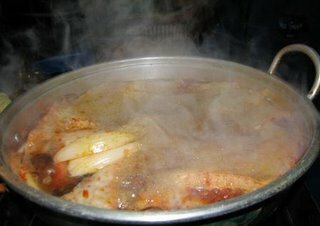 Hot pot stock is usually made from boiling water with beef or chicken bones, onions, pineapple, tomatoes, Chinese black mushrooms, taro, lemon grass and added sugar, salt and sometimes they add MSG, which some people think makes the taste weird and unhealthy. A seafood hot pot includes squid, shrimp, fish, tofu, vegetables, vermicelli or instant noodles. A mixed hot pot is similar but also has beef, pork, eel, frog, pig bladder and sometimes duck eggs for a sweeter soup. 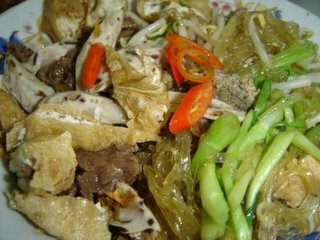 Goat hot pot is also a good choice, people saying that " goat's meat helps you to be stronger physically". I have eaten it a lot but I am not sure about that. Goat hot pot includes goat meat and lots of veggies. Let me know what you think after you try Kuong Nga where the food is good and the five sisters are very friendly. 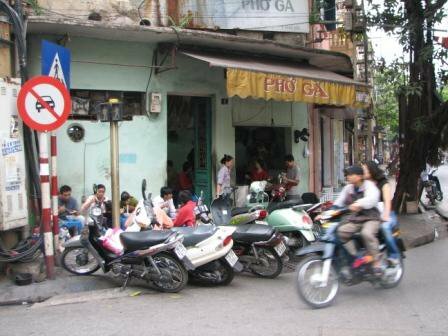 This is just a small restaurant located right at the corner of Bat Dan and Hang Dieu streets. Very good chicken soup. You can order chicken without skin or with skin, my friends and I usually eat tai ga, which means chicken and beef and some quay - deep fried bread. This place serves the best quay, always crispy and I love it. One of the sons and daddy always take care of the motorbikes and another son handles money and bills. Two old ladies deliver the quay and clean the dishes. 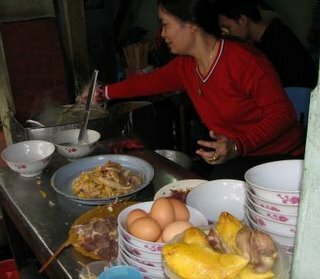 The mother is in charge of meat slicing and the daughter serves the bowls to customers. The best time to enjoy this noodle shop is in the morning. You have to sit on a short stool right in front of the restaurant and your table will be a taller stool. I love this way.